FORD FALCON XD ALL MODELS. XE XF & XG WAGON & UTE WHITELINE SUSPENSION BUSH KIT. 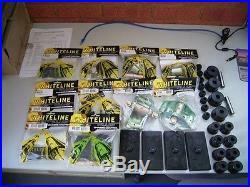 This Sale is for a full Black Poly Urethane Vehicle Suspension Enhancement Kit.. Suits all FORD Falcon XD Models..
And XD XE XF and XG Wagons Utes and Panel Vans.. (All with Leaf Springs) Consists of the following Poly bushes.. Front Lower and Upper Inner Control Arm bushes.. Front Shocker Upper and Lower Bushes.. Sway Bar link Front and mounting bushes (we need the bar diameter for these) Steering Coupling..
Rear Leaf Spring Saddle mount. Rear Shock Upper and Lower Bushes.. Rear Leaf spring Front and Rear Bushes. FIRSTLY - Please note we use normal EMAILS for all our correspondence. But if something does happen.. We will do everything we can to help.. We have been trading for over 30 Years , and only sell products of the best quality that we would and do use ourselves. All of our products are sourced from Australia`s leading Auto Parts Wholesalers. What is the quality like.. A note regarding pictures and descriptions on all our sales. All our contact details are below.. We are in Nutfield Victoria.. Rob Mills RINGWOOD AUTO PARTS. Powered by SixBit's eCommerce Solution. The item "FORD FALCON XD ALL MODELS. XE XF & XG WAGON & UTE WHITELINE SUSPENSION BUSH KIT" is in sale since Tuesday, September 27, 2011. This item is in the category "Vehicle Parts & Accessories\Car & Truck Parts\Suspension, Steering\Other". The seller is "nrap" and is located in Nutfield Victoria. This item can be shipped worldwide.